Oh yes, and apparently a guy called Remy Hii was casted for the movie. I'm going to update the topic. What’s everyone think of the new black and red suit? Eh, I don't really see it other than that it's black. Also, what Superior suit are we talking about? Version 1 or Version 2? If you want to be a real nerd, Spider-Man's costume in Amazing Fantasy #15 was technically black, not blue, so if anything this one is even more comic accurate than the last one. So recently a Russian site posted synopsis about the movie, in which it was said that Nick Fury will recruit Spidey to fight multiple 'elemental beings' that are threatning Europe. Out of these beings there are elementals of fire, water and sand. So once again they are teasing us Hydro Man and Molted Man, together with Sand Man. Pretty cool, IMO. I am looking forward for this. Gotta update the main topic soon. EDIT: Also, I don't understand why so many people commenting on this trailer (on other sites, not here) seem to think Marvel is lying about when this film takes place (post-Endgame) and think it's a prequel to Infinity War. What reason would Marvel have to lie about that? It gains them nothing, because if they were upfront about it being a prequel, no one would object. In fact, it would be better that way, because then FFM would not spoil Endgame. Instead, people believe that Marvel is lying about it being post-Endgame, which means Marvel is pretending that a movie which doesn't spoil Endgame actually does. Which is stupid. Because no one else is, I’m just going to give my thoughts. I love this trailer. I think the big reason lots seem so underwhelmed involves Spider-Verse, which I still have not seen. Mysterio’s reveal was stellar. He looks (and sounds) great! Totally agree. I'm sure the recent arrival of Into the Spider-Verse has made some people less interested...but it could also be that this trailer doesn't particularly reveal much (in order to avoid spoiling Endgame). It's basically just your standard hero vs. villain(s) trailer. Mysterio looks incredible; I'm actually a little amazed that they were able to make it work without seeming too corny. It looks exactly like what I would expect from him in this film--a skilled illusionist who wears a flashy outfit in order to make himself look like a hero, when in reality it will likely be him behind the Elementals' shenanigans. I really love the smoke effect in his fishbowl helmet. That was one interpretation from his various comic portrayals that I really liked, as it directly correlates to the whole "smoke and mirrors" aspect of his character, much more so than a fishbowl that's merely opaque on the surface would. but it could also be that this trailer doesn't particularly reveal much (in order to avoid spoiling Endgame). It's basically just your standard hero vs. villain(s) trailer. I would agree without the influence of Endgame, the ending of Infinity War, and the whole "Mysterio posing as a hero" thing. I have decided that I would like the Elementals if they were A: Mysterio's illusions, or B: Hydro Man, Sandman, Molten Man. I would prefer the former, as we wouldn't waste Marko or whatever the other two's names are, and then their plots wouldn't feel rushed or take up too much time. I also want to take the time to compliment the sound designer of Mysterio; the vibrations in sound are cool. True, but to the normal viewing audience, those might not be as important. I've seen a number of people who aren't even aware that this movie occurs post-Endgame. The fact that Spider-Man is one of the...unfortunates of Infinity War might certainly be on people's minds, but the average viewer likely isn't aware of Mysterio's history of subterfuge as a villain. So to a regular observer, this trailer is nothing more than a normal superhero teaser. I think Option A is 99% likely. The only "hints" that these beings might be Hydro, Sand, and Molten Man are the inclusion of some very relevant numbers in the scenes where they appear (namely, the numbers of the comics in which those characters first appeared). While that's a very interesting hint, it might be nothing. Plus, as you say, I'm not sure Marvel would waste three well-known villains by making them grunts that serve as preludes to Mysterio's ultimate reveal as a villain (assuming that is the plan). Also, I believe there was at least one official source identifying them as the Elementals, who are an entirely different group of four members representing Water, Earth, Fire, and Air. While only the first three appear in physical form, the scene at the Tower Bridge in London seems to show a tornado, as well as lightning, which might indicate the Air Elemental's presence. I gotta say, after seeing Spider-Verse I was already pretty underwhelmed with the concept of another live-action Spider-Man movie. It was probably the best Spider-Man thing we got last year. Dare I say better than Marvel's Spider-Man. Having said that, after seeing this new trailer, the hype has somewhat returned for me. Nothing is ever going to be as good as Spider-Verse, but this is shaping up to be a good sequel to a good Spider-Man movie. Thank you for saying everything my mind was thinking when I saw Mysterio the first time. I wholeheartedly believe the Elementals are Mysterio illusions and that he's doing the Syndrome. In that sense, I think they can technically be called "Hydro-Man" or "Molten-Man" or "Sand-Man," but they won't actually be the versions of those characters that we know. It'll probably be more like how the Tinkerer was in Homecoming. Yea, he's technically "The Tinkerer," but he's not the comic book Tinkerer. They'd be clever references and utilization of those characters. I actually find that really genius. They're finding ways to cleverly weave into these movies a lot of villains that aren't normally seen in Spider-Man media without needing to contrive reasons as to why they're the main villain (cough cough Electro in TASM2 cough cough). And yea, some might say they want to see a real Hydro-Man or Molten-Man or Sandman, but those villains have never had the impact other Spider-Man villains have had. Not to mention we've already seen Flint Marco Sandman once before. This is a cool way to pay homage to those characters without needing to bother with the baggage that would come with making them fully actualized characters. 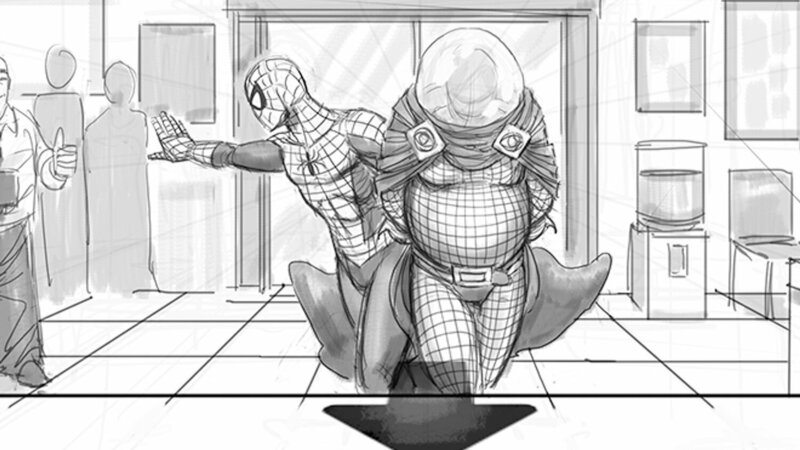 To what end Mysterio is using these illusions for, I do not know, as he has no real reason to hate Spider-Man. It may just be for fame, but I think it will be cool if they lean into the themes of responsibility more with this film. Think about it: Quentin Beck is a man who has amazing talents to build and use technology that he can use to be a real hero and help people. Instead, he uses it to achieve fame and fortune by manufacturing dangerous incidents. We see in one of the first shots of the trailer that Spider-Man is becoming famous and is pretty well-loved. What if Peter's internal conflict for this film is choosing to use his new-found independence as a superhero for fame and fortune, under Mysterio's influence? There's so much potential! What would Aunt May think about him turning away from helping people just because he can for money and fame? What about MJ? How would the general populace react? What about Happy and (hopefully) Tony? Could it all finally lead into more revelations about MCU Uncle Ben? In Homecoming, Peter learned his Power. I think in this film, he needs to learn his Responsibility.